London, Royal Academy, 1937, no. 367. 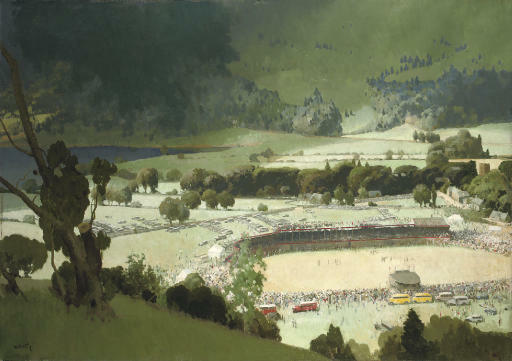 The Grasmere Sports is an annual event occurring on the third Thursday after the first Monday of August. Its origins are ancient, although records have been kept since 1850. Apart from the usual athletic sports, Cumberland and Westmorland wrestling, Hound Trailing and the Guides' Race (up to 1,000 feet and back in 12 minutes) are unique to this event which is internationally known and draws an average of 12,000 spectators annually.